EDF Renewables acquired the 200 MW Longhorn Wind Project from Renewable Energy Systems Americas Inc. (RES Americas) in the Fall of 2013. In 2015 EDF RE sold a 50% interest in the 200-MW Longhorn Wind Project to a fund managed by BlackRock’s Infrastructure Investment Group. 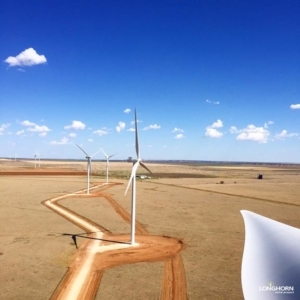 The Longhorn Project, located in Floyd and Briscoe counties, is comprised of 100 Vestas V-100 wind turbine generators each with a rated capacity of 2 MW. The project will interconnect to the recently completed Competitive Renewable Energy Zone (CREZ) transmission infrastructure which enables delivery of long-term, clean, competitively priced power from the strong renewable resource regions of West Texas to the rest of Texas. EDF RE remains closely involved in Longhorn Wind maintaining 50% ownership stake. EDF Renewables, the leading provider of renewable operations and maintenance services in North America, provided balance-of-plant operations and maintenance for the facility including 24/7 remote monitoring from its NERC compliant Operations Control Center (OCC).